Project the Batavia Kill Stream Management Plan (SMP) was developed after 4 years of watershed and stream corridor assessment in the Batavia Kill watershed. Since 1997, the GCSWCD and NYCDEP have been assessing watershed conditions, monitoring stream stability and undertaking demonstration restoration projects. Based on the data collected and input from various watershed stakeholders, the GCSWCD and NYCDEP completed the Batavia Kill SMP in 2003. This section provides watershed background information and characteristics which influence the Batavia Kill. A chapter on living streamside and stream related activities may be of particular interest to landowners, answering commonly asked questions, including necessary permits and agency contacts, relating to activities which may impact stream health or stability. This section includes a summary of water quality assessments that have been undertaken over the years in the Batavia Kill, an introduction to the science of stream processes, and a description of the watershed assessment protocol used to develop this stream management plan. This section contains very detailed descriptions and specific recommendations for the Batavia Kill, from the headwaters at the top of the watershed, downstream to its confluence with the Schoharie Creek, located in the Town of Prattsville. 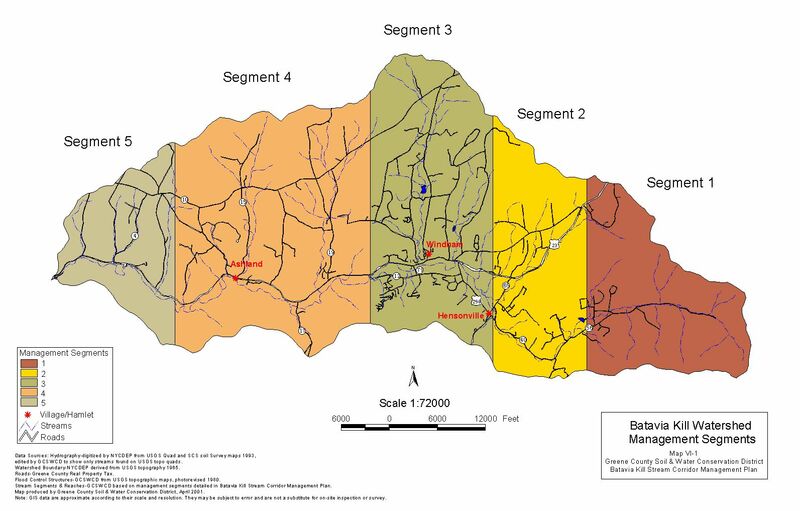 The Batavia Kill mainstem has been organized into 5 Management Units (MUs), defined using physical stream characteristics, historical channel alignments, location of bridges and road infrastructure, and valley characteristics. These MU descriptions outline stream conditions (its bed and banks), general streamside (riparian) vegetation condition, and proximity and arrangement of roads, bridges and culverts. This section sets forth an extensive list of recommendations related to education and outreach, flood protection, water quality, public enjoyment, fisheries, riparian zone management, stream management, and programmatic issues, providing a frame work for watershed stakeholders to develop a long term management strategy to protect and improve the Batavia Kill.